The Texas Watershed Steward program is a free, educational workshop designed to help watershed residents improve and protect their water resources by getting involved in local watershed protection and management activities. Presentation - New Braunfels Growth and Development - Garry Ford, Jr.
To learn more about the event, contact Ward Ling at 979-845-6980 or wling@tamu.edu. Bring your E-Waste for recycling! See this list for accepted items at the Parker Building Supply location: Ewaste-recycling list. The Geronimo and Alligator Creeks Watershed Partnership is offering free soil testing to area farmers, ranchers and homeowners. Attendees will have the opportunity to win a 40 gallon rain barrel to be raffled off as a door prize! This webinar will provide insight into wild pig behavioral drivers and will also discuss how these drivers tie in to wild pig management in both urban and rural areas. A brief project update will be provided on the latest events and workshops, and then we will have a class on Rainwater Harvesting administered by Dave Elder of the Guadalupe County Master Gardeners. This is a one-hour class, and is different from the 2 hour class we conducted earlier this month. The class will explain rainwater harvesting--spanning from a 5 gallon bucket to a 30,000 gallon tank, and will demonstrate how to make your own rain barrel. At the close of the class, a 55 gallon rain barrel will be raffled off as a door prize. Come out for a good time and explore the benefits of rainwater harvesting! Three lucky attendees won a 40-gallon rain barrel as a door prize for attending. Speakers will include representatives of AgriLife Extension, Texas Animal Health Commission, Texas Parks and Wildlife Department, Texas Wildlife Services and the Texas Department of Agriculture. Topics will include basic ecology and biology, feral hog effects on the Brazos River watershed, regulations for transporting, disease concerns, population dynamics and control techniques, including traps, as well as hunting regulations. There also will be discussion of feral hog resources available to the landowner. Jeff Hanselka, AgriLife Extension agent for agriculture and natural resources, Guadalupe County, said they have applied for five Texas Department of Agriculture continuing education units ï¿½ two general, two integrated pest management and one in laws and regulations ï¿½ for commercial, non-commercial and private applicators attending the program. The cost is $25 and includes lunch. To download an advertising flier and sponsor information, click here. The goal of the workshop is to better equip decision makers so that they are able to consider the impacts of nonpoint source pollution in their daily activities. See letter of invitation for more details on class description. The Workshop is approved for 6 hours of Certification Maintenance by the American Planning Association. Refreshments at 5:30 and meeting begins at 6pm. A Texas Riparian and Stream Ecosystem Workshop is scheduled for Tuesday, September 17th, from 8am to 4pm. It will be held at the GBRA River Annex at 905 Nolan Street in Seguin. The workshop will focus on the nature and function of stream and riparian zones and the benefits and direct economic impacts from healthy riparian zones. A riparian zone is the area along the bank of a stream, creek, river or lake. The program will cover an introduction to riparian principles, watershed processes, basic hydrology, erosion/deposition principles, and riparian vegetation, as well as potential causes of degradation and possible resulting impairments, and available local resources including technical assistance and tools that can be employed to prevent and/or resolve degradation. This one-day training will include both indoor classroom presentations and outdoor stream walks. Monday, June 10, 2013 at 6:00 p.m. 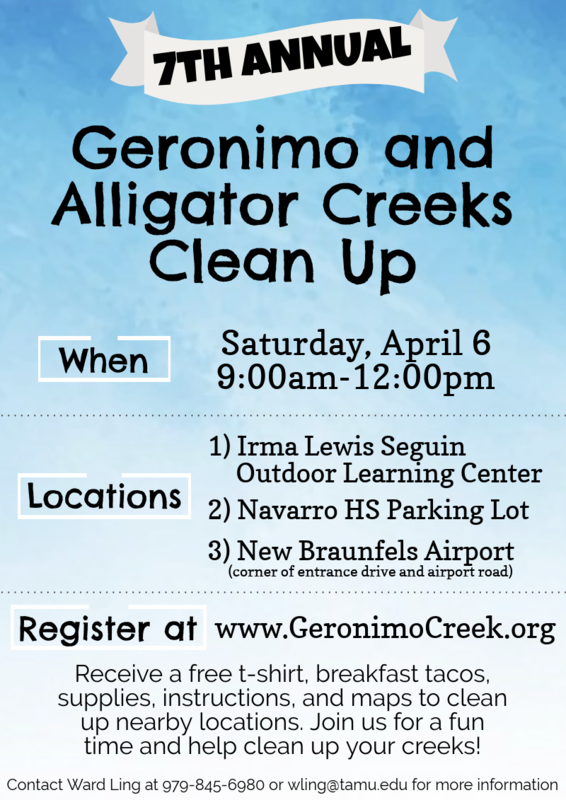 The first annual Geronimo and Alligator Creeks Cleanup Event is scheduled for Saturday April 6th, from 9am to 12 noon. Participants will meet at the Navarro High School parking lot and the New Braunfels Airport parking lot at 9am to receive instructions, supplies, and a light breakfast. From there, crews will leave to remove trash from public road crossings and other areas identified for trash pickup in the Geronimo and Alligator Creeks area. People wanting to participate in the event are asked to register before March 23, if possible. Participants need to contact Ward Ling to register for the event by calling 979-845-6980 or emailing . Tuesday, February 26, 2013 at 6:00 p.m.
Tuesday, November 13, 2012 at 6:00 p.m.
Tuesday, August 7, 2012 at 6:00 p.m.
Tuesday, November 1, 2011 at 1:30 p.m.
Tuesday, October 11, 2011 at 6:00 p.m.
Tuesday, July 12, 2011 at 6:00 p.m.
Tuesday, June 14, 2011 at 6:00 p.m.
Tuesday, February 8, 2011 at 6:00 p.m.
Tuesday, November 9, 2010 at 6:00 p.m.
Tuesday, October 12, 2010 at 6:00 p.m.
Tuesday, August 10, 2010 at 6:00 p.m.
Riparian Areas - What are they Worth? Tuesday, June 8, 2010 at 5:00 p.m.
Tuesday, June 8, 2010 at 1:00 p.m.
Monday, June 7, 2010 at 2:00 p.m.
Tuesday, May 11, 2010 at 6:00 p.m.
Monday, May 10, 2010 at 2:00 p.m.
Tuesday, April 13, 2010 at 5:00 p.m.
Tuesday, April 13, 2010 at 1:00 p.m.
Monday, April 12, 2010 at 2:00 p.m.
Tuesday, March 9, 2010 at 5:00 p.m.
Tuesday, March 9, 2010 at 1:00 p.m.